Five of the seven Bahais arrested in raids on Bahai homes in Bushehr on February 13 were released on bail on March 13. Bail was set at 250 million tumans (53,000 euros ; $US 66,000). 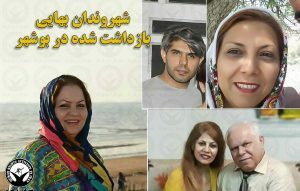 Those released on March 13 are Minou Reyazati (مینو ریاضتی), Asadollah Jaberi (اسدالله جابری) and his wife Ehteram Shakhi(احترام شخی), Leqa Faramarzi (لقا فرامرزی). Emad Jaberi (عماد جابری) and Puneh Nashari (پونه ناشری) were bailed a week earlier. Emad Jaberi (عماد جابری) and Puneh Nashari (پونه ناشری), two of the seven Bahais arrested in coordinated raids on Bahai homes in Bushehr on February 13, have been released on bail. Bail was set at 50 million tumans (10,700 euros; $US 13,300). Mrs. Nasheri has two children, aged 2 and 7, who have been affected by the absence of their mother. A source close to the arrestees said that, since their arrest, all seven have moved back and forth between the prison and the interrogation facilities of the Ministry of Intelligence. It appears that the judiciary have no information on the reasons for their detention. At 7.30 in the morning of February 13, security forces staged coordinated raids on the homes of Bahais in the Province of Bushehr and arrested at least seven Bahais. Those arrested are named as Minou Reyazati (مینو ریاضتی), Asadollah Jaberi (اسدالله جابری) and his wife Ehteram Shakhi(احترام شخی), Emad Jaberi (عماد جابری), Leqa Faramarzi (لقا فرامرزی) and Puneh Nashari (پونه ناشری). Their homes were thoroughly searched, and personal effects such as laptops, books, flash drives, external hard drives, and family photograph albums were seized. Mr. Jaberi and his wife were detained at their workplace. No information on the reasons for the raids or where the Bahais are being detained is available thus far.